Godfrey Hall is an award-winning UK based travel journalist and member of the British Guild of Travel Writers. He has been in search of elves in Iceland, traveled to the depths of central Australia and been off the beaten track in Bulgaria. The Queen Mary 2 (QM2) recently returned from a very special world cruise that started in January to celebrate her 10th birthday. We had the privilege of joining the final leg of her voyage. The journey lasted 18 nights and returned us to Southampton, England, on May 9 with plenty of pomp and circumstance. A magnificent ship, this passenger liner has the charm and class of a 1930s liner — although it is equipped with the latest in 21st-century technology. Onboard we found plenty of things to do, including special talks, amazing theater acts, various swimming pools, and sports and activities for all ages. Equally important, the staff was there to satisfy every need. There were also plenty of dining options, including Todd English for special occasions — where the service is outstanding, the food rather special, and the ambiance quiet and discrete. In contrast, the Britannia Restaurant offers two sittings. However, if you want to sit on your own (as we did), make sure you sort this out at the beginning of your trip. Other alternatives for dinner exist around the ship, and breakfast can be taken in a variety of locations including the large and extensive Kings Court Buffet on Deck 7. Top Tip: If you know that a ship is going to be nearly at full capacity, then make sure that you have a strategy so that you don’t hit the buffet at peak times or attempt to find a lounger in the middle of the day. Good planning can go a long way toward making any trip successful. On the QM2 there are plenty of alternatives when it comes to meal times. There is also always somewhere to hide away if you want to find a quiet spot away from the hustle and bustle. 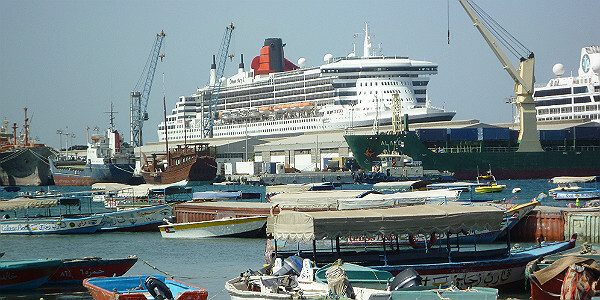 Our first port of call was Muscat in Oman. The ship docked close to the city center, and it was just a short shuttle bus ride to the famous souk where you can haggle for a range of goods. I also took one of the alternative tours that were on offer and enjoyed a well-organized Big Bus Tour around the city. There were plenty of places to get off en route, and each had been carefully planned to provide a good range of sights including the Parliament building, the Royal Opera House and beaches. 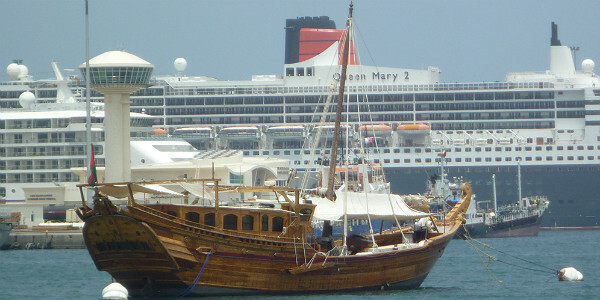 After Muscat there were several days at sea, sailing along the coast of Oman and Yemen and through pirate territory where the ship went on alert in case of problems. We were briefed about the situation and told what to do should there be an incident, including moving into a secure area. Top Tip: Oman can get very hot (even in May when we visited), but plenty of water, sunscreen, sensible clothes and comfortable footwear will help a great deal. Originally this stop was supposed to have been Egypt, but it was changed for security reasons due to the current political situation. 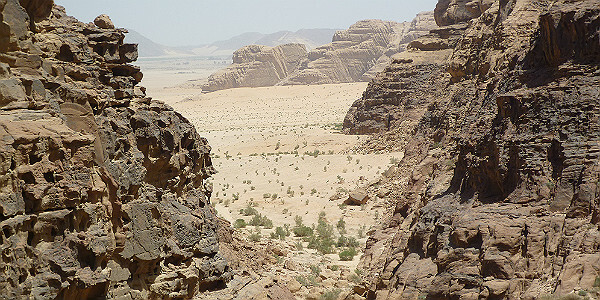 However Aqaba is an ideal port for visits to Petra and Wadi Rum. It is a colorful town, and there are plenty of local shops to explore, as well as a small but interesting museum and a number of beaches. I decided to make for Wadi Rum. Accompanied by a tour guide from the local tourist office and a driver, we travelled for 45 minutes into the desert where we experienced some spectacular scenery. The site has a visitor’s center and the opportunity to go out farther into the desert in a 4×4. Top Tip: If possible, take the trip out into the desert to Lawrence of Arabia’s camp and also to one of the Bedouin camps that have been set up to provide overnight accommodation, food and a chance to soak up the atmosphere. A long way from the city lights, this is a great way to spend a night or weekend if you have the time. We reached Rome via the Suez Canal, slipping past Sicily early in the morning, which provided a chance to see Mount Etna and the tiny island of Stromboli. 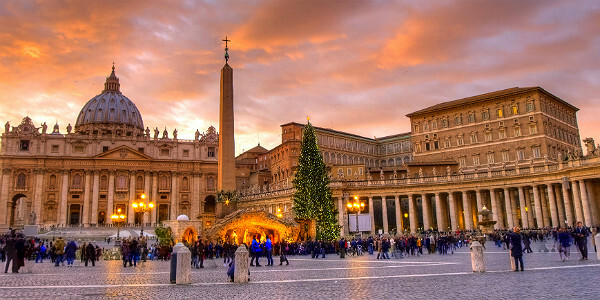 We took an escorted tour of Rome with Cruising Excursions, as this was our first visit to the historic city. Top Tip: If you find yourself in a similar cruise time-crunch, my advice is to treat this as a taster and then arrange to go back to Rome at a later date. Lisbon is a delightful city with lots of character and plenty of charm. People were friendly, and we found that the main sights were within walking distance of each other. 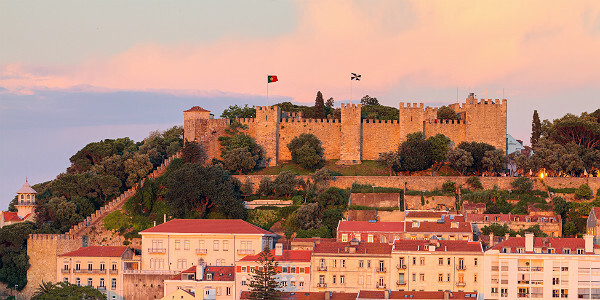 One of these was Lisbon Castle, which lies at the top of a steep hill and offers a fantastic view of the city. Look out for the betrayal door, which cannot be seen from the outside, as well as the camera obscura. The main shopping area is also well worth a look as prices are very low compared with many other European countries. Top Tip: Definitely stop off at a café and try some of the wonderful custard tarts (called pasteis de nata) with a strong Portuguese coffee or ginjinha (a sweet cherry liquor).